Alex Hampson’s finest hour in a Nene Valley Harriers vest came back in 2013 when he won the Under 17 South of England Cross-Country Championship. The long-striding 18 year-old has had his fair share of ups and downs since then but now seems to be returning to his consistent best, which was demonstrated with a sparkling run in Saturday’s North Midlands Cross-Country League race at a sunny Shipley Park in Heanor. Running in the senior men’s race, Hampson asserted himself early on when he was up with the leaders. Despite his tender years the 2015 Peterborough 5k Grand Prix champion showed great tenacity on the energy-sapping course, finishing in 17th position overall and, perhaps more significantly, second-placed Under 20. That was a fine achievement especially given that the Bourne-based athlete has a further year in the category. Michael Channing was next home for Nene Valley in 40th place with Niamh Payne 45th and Austin Herbert 51st. Harriers’ Under 17 girls are closing in on the league title after finishing as runners-up in Saturday’s race, and they lead the series with just one race to go. Megan Ellison was towards the front of the field as usual, finishing third, while Josie Fortune in seventh and Ellie Piccaver (11th) provided stroing support. The team will hope to clinch the league title at the final fixture of the season in Nottingham next month. Nene Valley’s Under 17 boys secured third place with Brad Allan leading them home in seventh position ahead of Ollie Oakley (12th) and Codi Leigh-Middleton (14th). A feature of the club’s senior ladies this term has been the consistency of the athletes and this was in evidence again on Saturday. Despite lacking the classy Philippa Taylor, the ladies ran well as a team and were led home by Nicky Morgan in 28th place. Ruth Jones, Sophie Wilkinson-Hargate and Louise Blake occupied 31st, 32nd and 33rd places. The Under 13 boys finished fourth with Hugo Brill 17th, Angus Bowling 18th and Freddie House 20th while Matt Dowling was 10th in the Under 15 boys race and Jack Haunch 13th in the Under 11 boys run. Nora Brill, one of three siblings at Nene Valley, was fourth in the girls Under 11 race with Evie Hemmings finishing 11th. Lottie Hemmings led the Under 13 girls into third place with Elisha Foord and Niamh Rushton providing stirling support. For the Under 15 girls, Amber Park ran well to take 11th place - four positions ahead of Katie Tasker. Philippa Taylor was beaten but now bowed after a rare defeat on Sunday in the Bedford Half-Marathon. On a testing course, the 49 year-old Nene Valley flyer had to settle for second place behind American teenager Taylor Bickford. The Nene Valley Harriers veteran finished over two minutes behind the impressive Bickford, but with a time of 84:21 she was first veteran by a margin of almost three minutes. Stamford Strider Mark Popple was the first local man home, finishing 45th in 1:25:46. Clubmate Mark Spencer was close behind in 48th with a 1:26:18 clocking. 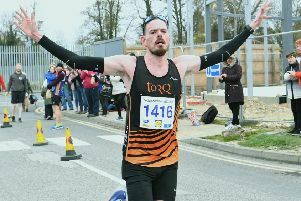 Thorney’s Darren Hine finished 52nd in 1:26:36 and a third Stamford Strider, Stuart Hodgkin, came home in 1:28:27 for 67th plae. In a strong ladies field Caroline Woods of Yaxley Runners finished fifth in 1:28:55.